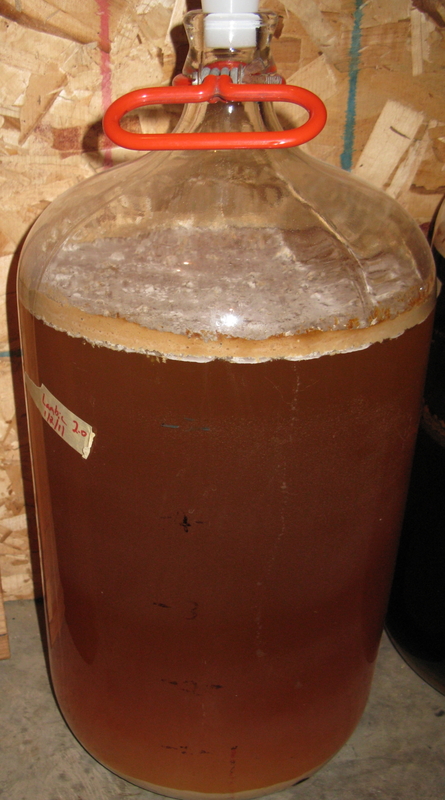 Lambic #2 — A New Years Tradition? A note on using raw wheat. This required I do a cereal mash first, to help break down the wheat so that the starches are more accessible to the enzymes in the malts. The term for this is gelatinization. It is not a necessary step in flaked wheat, but I figured the day was going to be shot doing this, so lets go all the way. Mashing process: This mash was done in 2 steps. The first is the cereal mash. 3.0# of raw wheat were mixed with 0.5# of pilsner malt. 5.25 quarts of warm water was added. This sat at 80F for about 30 minutes, due to the stove being taken. Then I raised the temp, slowly, stirring the whole time, until the temp was 123F. I then let this sit for 15 minutes, stirring and reheating to keep the temp around 122F. Then it was raised slowly, over about 10 minutes, to 150F, where it was held for 30 minutes, moving it off and on the heat, and stirring constantly. Then the whole thing was brought to a boil over about 15 minutes while stirring. Once it hit boiling, I took it off the heat. I then struck 8.25 quarts of 131F water with 5.0# of pilsner malt and 0.5# of wheat malt. This was allowed to rest at 122F for about 15 minutes. As this was resting, I went back to the cereal mash, and brought it back to a boil, stirring constantly, for about 15 minutes. Then, I combined the 2 mashes, and the temp went up to 140F. I took out 2qts of thin mash, and put aside in a pot. This small pot was brought to a boil, to denature the enzymes and keep it starchy, as 2 quarts of water was brought to a boil, and added to the main mash. The temp only went to about 144F, so 3 more quarts of boiling water was added. This time, the temp went to 153F. I pulled off 1 more quart of thin mash at this point, and added it to the other 2 that were boiled, and brought all 3 quarts of the thin mash back to a boil to denature. For sparging, I added about 3quarts of boiling water to the mash tun, then vorlaufed into the kettle, with the heat on to help stop the process. I added the reserved boiled 3quarts of thin mash right to the kettle, and then batch sparged, the first runnings being 1.055, the second being 1.040, and the third being 1.020. I got 8 gallons of 1.040 wort at the start of boil. I added the hops 30 minutes into a 90 minute boil. I did use Fermcap -S as well for the boil. At the end, I had 5.5 gallons in the carboy at a SG of 1.047. The yeast used are washings from the lambic brewed in 2009, and the washings from the primary of a red I brewed in December 2010 using Bugfarm from East Coast Yeast. I will use 0.5oz of hungarian oak cubes in the carboy. No racking, this puppy will sit on the sediment the whole time. I brewed this beer on 1/2/11. I will likely brew my next one some time around new years 2012. I am planning on repitching this culture over a few times, letting it get more sour as we go. On a whim, I checked the gravity today, and it was down to 1.004 already. The color is cloudy, light yellow color. It is very funky on the nose, with that horse/barnyard smell, as well as some faint citrus notes, still pretty rough. The mouthfeel is very light, but shockingly, this is very tart, by far my tartest sour to date, and only 4 months in. I am eager to see what this is like at the New Year. 1/16/12 — I posted the first tasting notes here.